Chiang Rai Governor Narongsak Osottanakorn said Sunday's rescue mission has come to an end and will begin again in 10-20 hours, depending on weather conditions. Rescue teams gather in a cave on June 25, 2018, where 12 boys and their soccer coach went missing in Chang Rai, northern Thailand. Four boys have been rescued from the flooded Cave on Sunday, Al Jazeera's Scott Heidler reported. Heidler noted that the four boys had been rescued in pairs, as each two were escorted out of the Tham Luang cave complex only minutes apart. Raw Footage: Moment Boys TRAPPED in Thailand Cave FOUND ALIVE!!! "In a normal situation, you would have experienced professionals that might need rescue, not someone who's a complete novice who's never been in the water before, let alone who can't swim. In a Facebook post, the Thai navy SEALs vow to bring the Wild Boars youth football team home. "I love you, Dad, Mum, and my sister. You don't need to be worried about me." Thailand cave boys send handwritten letters to their families. Anmar Mirza, a cave expert and US National Cave Rescue Commission coordinator, told Al Jazeera that the boys' weakness due to nine days of starvation makes the rescue operation risky. "It takes a long time to recover and they have simply not had that time. I’m hoping that they have drilled well enough that there aren’t any problems but it’s still a huge risk," he said. "The divers have built a level of trust with the boys and that's part of the psychology of getting them out. In most of the places, the diver can be right next to them. There are those few spots where they cannot be side by side, but again they can communicate with them by the fact that they're just right close there. So, with luck, that keeps them calm." The boys and their coach are trapped kilometers deep inside and will have to make their way out through passages, some of which are fully submerged. More than seven hours into the operation, the first boys make their way out of the cave. Bangkok Post reported that a source told them the football team and their coach would be rescued in four batches: one of four and three of three people. In a press release containing an update on the rescue mission, which has now been underway for more than eight hours, Osottanakorn said: "divers will work with medics in the cave to assess the boys' health before determining who will come out first". Two ambulances have been seen leaving Tham Luang and one helicopter has been heard taking off. Helicopters have been waiting to take the members of the football team to Chiang Rai's state capital where the boys and their coach will be treated in hospital. The rescue base camp has been set up in chamber three, situated about two kilometers into the cave. Doctor Andrea Danese, a Psychiatry lecturer at King’s College in London, told Al Jazeera that he expects most of the children to present emotional symptoms. Let’s not forget about Saman Gunan. 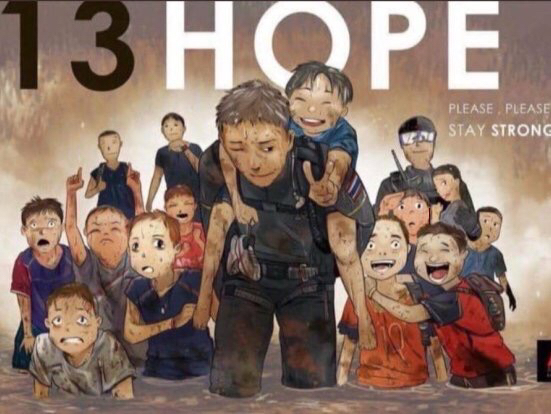 RIP Saman Gunan #ThaiCaveRescue A Hero's heart is the size of a Lions. Thai soldiers relay an electrical cable deep into the Tham Luang cave at the Khun Nam Nang Non-Forest Park on June 26. Thai soldiers carry a hose deep into the cave to pump out water on June 27. A team of SEAL divers inspects the water-filled tunnel in the cave on June 28. Thai soldiers carry equipment inside the flooded cave complex on July 2. Family members near the cave celebrate the news that the team and their coach were found alive on July 2. Rescuers are sent inside the cave on July 3. Some members of the team in the cave on July 4. A family member prays before a shrine in the Tham Luang cave area as rescue operations continue on July 5. Military personnel carries surface supply diving cables out from the cave complex on July 5. Water is pumped out of the cave complex on July 5. An honor guard holds up a picture of former Thai Navy SEAL diver Samarn Kunan on July 6. Thank you for writing stories that we care about. God Bless the men and women who selflessly put their lives on the line to help others. Thoughts and prayers for these children and brave divers. Great article Lexy. Thanks for keeping us posted. Praying for these brave men & strength for all. So sad the rescuer died. Good for everyone to remember the risk first responders take to help others. Thanks for including that, and for a great article covering the rescue operation. Very good Lexy. What a story, I hope they can get them all out safe. This looks like a complex rescue mission. I have been following this story and really thought I knew the whole story. You opened my eyes. I knew it was a miracle mission, but I had no idea it was this harrowing. Thank you for this compilation. God is with these kids and rescuers. The most thorough explanatory article I have read to dat on this situation. Awesome job Lexy! Thank you for making it clear. The worthless MSM should take notes on the way you present information. God bless and KEEP WRITING! !